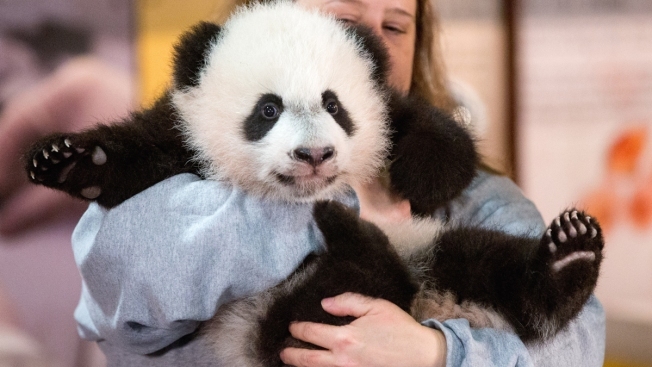 Animal keeper Nicole MacCorkle holds Bei Bei, the National Zoo's newest panda and offspring of Mei Xiang and Tian Tian, for members of the media at the National Zoo in Washington, Dec. 14, 2015. Members of the National Zoo in Washington are getting an exclusive peek at panda cub Bei Bei. The cub, who was born Aug. 22, is set to make his public debut Jan. 16, but zoo members can see him starting Friday. Visitors who want to see Bei Bei -- will have to show they have a current Friends of the National Zoo membership and a matching photo ID. Bei Bei, born weighing just four ounces, is now about 21 pounds, keepers said this week. He is working on crawling and is learning to climb the rocks in his enclosure. The cub is the third surviving offspring for parents Tian Tian and Mei Xiang, who also live at the zoo along with their second cub, Bao Bao, who was born in 2013. Bei Bei's twin brother died days after their birth, and Bao Bao's twin sister was stillborn. A single cub born in 2012 lived just a week. Tian Tian and Mei Xiang's first surviving offspring, 10-year-old Tai Shan, lives in China.